Today I wanted to talk about Personal Hotspot. One of the really cool features of Verizon Wireless Prepaid is you are allowed to use hotspot with your prepaid plan. For those of you who don’t know,Personal Hotspot, is a feature many smartphones have that lets you share your phone’s cellular data with your laptop, tablet, or other devices so they can connect to the Internet. With portable hotspot, you connect your devices to your smartphone using Wi-Fi but you can also use Bluetooth or even a USB cable. To use hotspot, both your phone and your wireless company need to support the feature. Fortunately, Verizon Wireless Prepaid does. Now in the rest of this video, I’m going to show you how I to set it up on my iPhone 6 using iOS 10. If you have a Samsung or other Android phone, see Using Tethering & Portable Hotspot: Nexus 5x and Verizon Wireless Prepaid. 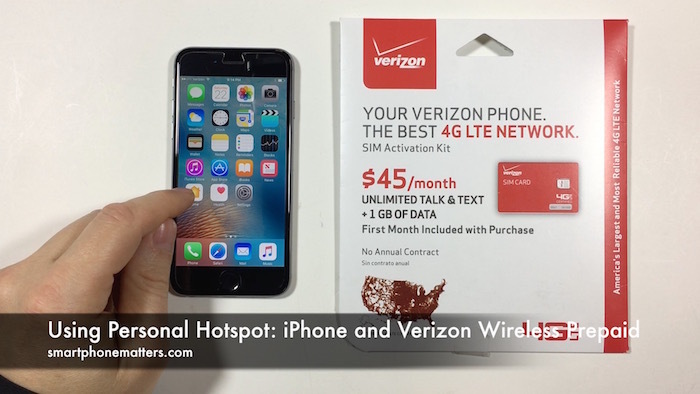 Check my smartphonematters.com or the smartphonematters youtube channel if you want to see Hotspot on an iPhone. You’ll see a small icon in the top left of the status bar indicating that Portable Hotspot is on. Once turned on, I’m able to connect my iPad Air to the Bob’s iPhone access point and connect to the internet. I opened Safari and browsed smartphonematters.com. Back on the iPhone 6, . You’ll see the top of the screen is blue indicating Personal Hotspot is on and it will display the number of devices connected.